Solving optimization problems subject to constraints given in terms of partial d- ferential equations (PDEs) with additional constraints on the controls and/or states is one of the most challenging problems in the context of industrial, medical and economical applications, where the transition from model-based numerical si- lations to model-based design and optimal control is crucial. For the treatment of such optimization problems the interaction of optimization techniques and num- ical simulation plays a central role. After proper discretization, the number of op- 3 10 timization variables varies between 10 and 10 . It is only very recently that the enormous advances in computing power have made it possible to attack problems of this size. However, in order to accomplish this task it is crucial to utilize and f- ther explore the speci?c mathematical structure of optimization problems with PDE constraints, and to develop new mathematical approaches concerning mathematical analysis, structure exploiting algorithms, and discretization, with a special focus on prototype applications. 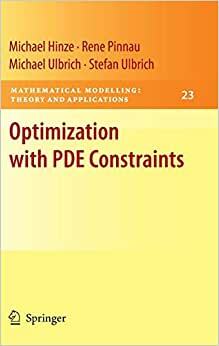 The present book provides a modern introduction to the rapidly developing ma- ematical ?eld of optimization with PDE constraints. The ?rst chapter introduces to the analytical background and optimality theory for optimization problems with PDEs. Optimization problems with PDE-constraints are posed in in?nite dim- sional spaces. Therefore, functional analytic techniques, function space theory, as well as existence- and uniqueness results for the underlying PDE are essential to study the existence of optimal solutions and to derive optimality conditions.